First and foremost, it is worth noting that Kamperveen excelled in a variety of different sports. This was a versatile athlete: adept in athletics, basketball, judo, boxing and jujitsu. In fact, he actually set up the Suriname Judo Association in 1968 and became its first president. However, it was always football that interested him most and that was the sport which he was best at. Born 27 September, 1924, Kamperveen was first introduced to the beautiful game as an 11-year-old on Dr. Sophie Redmond Street, in Suriname’s capital, Paramaribo. Even at this early stage, there were initial signs of serious potential. His time playing football in Suriname was short-lived as he was called up for military service as a fresh-faced 18-year-old in 1942. This required leaving his homeland and visiting the Netherlands, which turned out to be a blessing in disguise for Kamperveen’s footballing development. He spent a solid few years at MVV Maastricht whilst on military duty and built up an impressive reputation, starring in MVV’s league title winning season in 1948. Some silverware had been coming after a second-place finish the campaign before. Away from his home country, Kamperveen was still developing physically and emotionally. Playing in a successful team and being a significant part of it must have made an enormous difference to his settlement and confidence, and this acted as a springboard for more success further down the line. In 1950, Kamperveen became the first Surinamese player to ply his trade in Brazil. He signed for Paysandu Sport Club on a one-year deal, joining a team that was accustomed to winning trophies, especially in the 1940s. This offered a completely different and unique experience for Kamperveen, who was a long, long way from home and he had to pick up Portuguese in order to communicate with his teammates and coaches. He learned many new things in Brazil, where football was extremely popular at the time and continues to be, reinforced by the fact Brazil were hosts of the 1950 World Cup. He was a leader on the pitch and therefore it made perfect sense for him to captain Suriname, which he did throughout the 1940s. In the national team’s 9-0 thrashing of neighbours French Guiana in March 1947 – their biggest win to date – Kamperveen was at the forefront of everything and scored four goals. A speedy and intelligent centre-forward, Kamperveen had a natural instinct for goal and his teammates could nearly always rely upon him to deliver the goods. His stellar performances in the Surinamese strip earned him a spot in the 1952 Caribbean All Stars team, along with compatriots Michael Kruin, Michel Treetop and Humphrey Mijnals. The All Stars played four matches against Jamaica in aid of the Jamaican Hurricane Relief Fund and they were shared equally with two victories for each side. At this point Kamperveen was approaching his 30s and beginning to look elsewhere for new challenges. Indeed, he moved to the Netherlands two years following his appearances for the All Stars, to study at the CIOS University in Heerenveen. During this time period he managed his studies with playing professional football with now-defunct HFC Haarlem – who went bankrupt in 2010 – in the Dutch first division, becoming the the first player from Suriname to earn a professional contract in the Netherlands. Haarlem were the Netherlands’ oldest football club having been created in the late 19th century and had Ruud Gullit in their ranks in the 1970s. Kamperveen arrived at the best time: professional football had just started after many Oranje national team members joined clubs abroad in search for financial benefits, so the Royal Dutch Football Association (KNVB) had little choice other than to pay the players. He obtained his diploma in 1956 and achieved his KNVB football A-certificate one year later which effectively enabled him to coach to a high standard. And so Kamperveen finished his playing days at Haarlem having spent the bulk of his career in the Netherlands, arguably enjoying the most success and satisfaction at MVV in his early 20s. As mentioned, Kamperveen was a man capable of many things. There was a strong feeling that he would be well suited to management and he gained first-hand experience with Surinamese club Transvaal, who have 19 Hoofdklasse titles to their name. Six of those title triumphs came in the 1960s, widely seen as their golden era. Here Kamperveen learned the basic principles and techniques of management. It was inevitable that he would, at some stage, take charge of the national team and his appointment was confirmed in 1958. By all accounts his time at the helm proved successful and the country’s football grew stronger, to the point where they reached the final round of 1978 World Cup qualification. By this time Kamperveen had left his post and Walther Brathwaite was the boss but the foundations had been set. 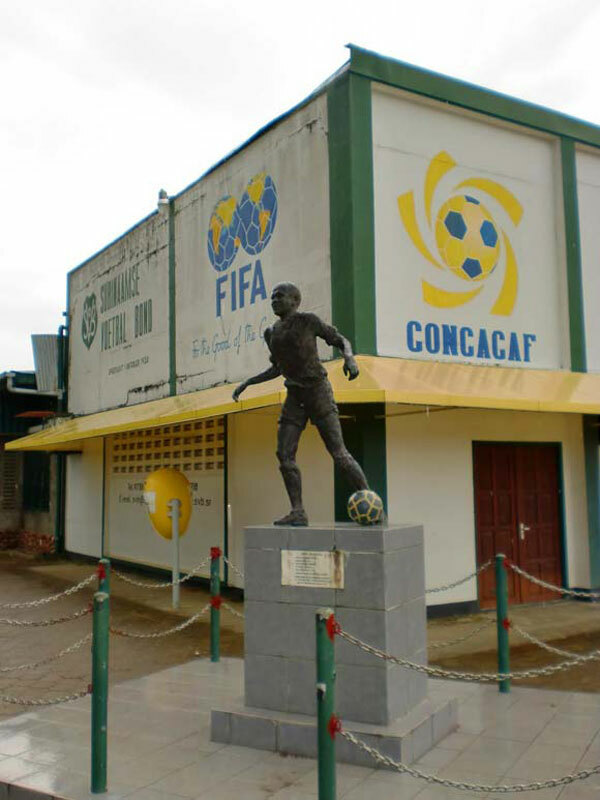 Furthermore, Kamperveen became a member of the Surinaamse Voetbal Bond (SVB) in 1964, three years after they’d been affiliated to CONCACAF (which, incidentally, began in 1961). His association with CONCACAF got much more serious as he was named a member of the confederation’s disciplinary committee and then vice-president in 1977. Kamperveen played a huge role in creating the Caribbean Football Union (CFU) in 1978 with the help of former Trinidad & Tobago player Patrick Raymond. Kamperveen became the CFU’s first president and was in the job for four years before the notorious Jack Warner succeeded him. What’s more, ‘Ampie’ was installed as a FIFA board member and rose up through the ranks to vice-president. He was present at the opening of the 1982 World Cup held in Spain. What started out as assisting his country’s association escalated into exuding influence at the very top of world football’s governing body. He, along with several other members, pioneered the CFU and thus got Caribbean football into the limelight. Kamperveen’s death was brutal and merciless. But what are the 1982 December Murders? And what exactly happened? On 25 February 1980, Dési Bouterse spearheaded the Sergeants Coup as he and fourteen other sergeants overthrew the Henck Arron government with a violent coup d’état, marking the start of the military dictatorship that lasted in Suriname for 11 years. Bouterse – who was simultaneously in charge of the Surinamese army – imposed an evening curfew, curtailed freedom of press (the newspaper de Ware Tijd could still publish but not without heavy censorship), banned political parties and restricted freedom of assembly. Under this military dictatorship democracy was entirely wiped out. In the infancy of this government, however, Kamperveen thought he saw opportunities (in hindsight he naively thought this) to promote and develop sport in Suriname. Henk Chin A Sen, a member of the cabinet, hired him as deputy Minister of Sport and then Minister of Youth, Sport and Culture. It soon became apparent to Kamperveen, though, that this military dictatorship had absolutely no intention to hold elections and restore democracy. As a result ‘Ampie’ resigned and joined the democratic, peaceful protest movement. He, along with 14 young prominent Surinamese men, heavily criticised the Bouterse government and the consequences were fatal. Kamperveen was arrested on 7 December between 2am and 5am while sleeping in his home, his dogs were shot and grenades were thrown. Bouterse’s soldiers took him to Fort Zeelandia, the president’s headquarters, where 12 other victims were also stationed. Here they were tortured and shot dead with reports suggesting that Kamperveen’s body showed injuries to the jaw and a swollen face, as well as 18 bullet wounds in the chest, a shot wound in the right temple, a fractured femur and fractured arm. Journalists, businessmen, union leaders and lawyers were killed at the same place. Kamperveen was in such a horrendous state that his body could not be shown on television. His radio station’s building was destroyed by the soldiers as they labelled it as a so-called “counter-revolutionary stronghold.” Kamperveen trusted Bouterse, too, even inviting him to his fifty-eighth and last birthday. His son Johnny, the famous radio producer and journalist, once said: “What I regret is that he was murdered by someone he trusted.”. In the December Murders trial that commenced on November 30, 2007 there were 25 suspects with Bouterse being the only main suspect. The perpetrators of these murders have never been tried. Bouterse is widely regarded as the mastermind of these killings yet, incredibly, amnesty was actually granted in April 2012, causing immediate termination of the trial. The amnesty law was passed with 28 votes in favour and 12 votes opposed. In addition, the Dutch Supreme Court convicted Bouterse for cocaine trafficking and sentenced him to 11 years in prison in 1999. However, he never served his sentence as Suriname like many countries does not extradite its own nationals. The controversial amnesty law received much national and international protest. Organizations such as the United Nations, Human Rights Watch, Amnesty International, Reporters Without Borders and the Inter-American Commission on Human Rights condemned the law. Surinamese people took to the streets to campaign and show their support for the victims families. Consequently, the Netherlands immediately stopped the 20 million euro aid that was planned to go to Suriname. Ever since there has been friction between the two countries. So what is Bouterse up to nowadays? He’s president of Suriname, having been democratically elected in July 2010. The search for justice continues. Not many footballers are lucky or indeed revered enough to have a stadium named after them. In 2000, to celebrate the SVB’s 80th anniversary, the Suriname Stadium changed its name to the André Kamperveen Stadium. This was a way of Surinamese football giving back to one of their heroes – to commemorate and respect somebody who always put his country first. Current Hoofdklasse clubs Transvaal and Walking Bout Company use the stadium for home games while the national team will be playing their 2018 CONCACAF WCQ there against Nicaragua in June. It’s located in the heart of Suriname, where Kamperveen’s journey began. Just what he would have wanted. André Kamperveen will live long in the memory of many Surinamese people as well as all those he worked with, in football, business, journalism, administration and politics. He was a hero on and off the pitch. A believer in the greater good, helping others, democracy. He was a one-off. May ‘Ampie’ continue to RIP.